“Hello to all of you wonderful knitters, crocheters and wool-donors. 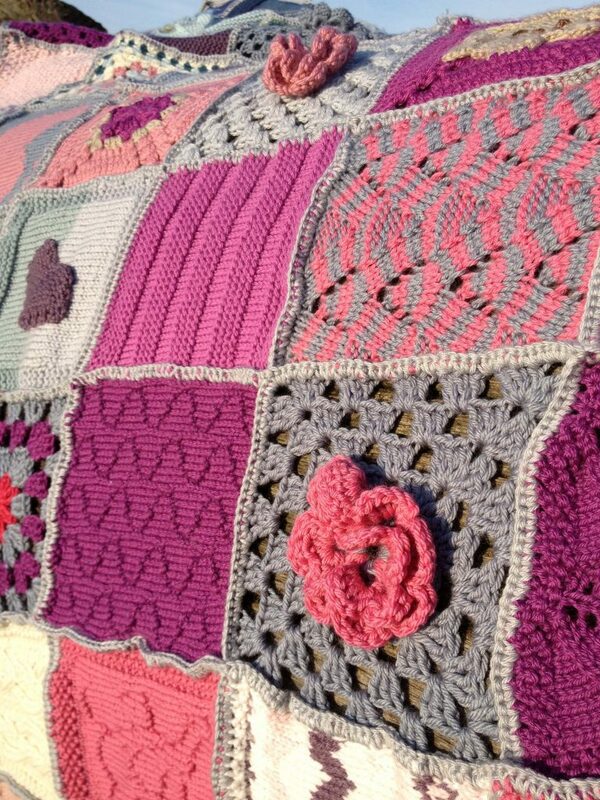 I met with the wonderful Pistey yesterday and collected our large blanket – it is absolutely glorious. Thank you, thank you, thank you to each and every one of you. The love, talent, time and effort that goes into each square is so impressive. And even those ‘plain squares’ are anything but when you look closely at them. MrK and I spent a long time looking at our blanket last night and still new things kept jumping out at us – the many beautiful hearts, the customised teddy buttons, the stunning crocheted flowers, initial letters, the two footprints and on, and on; all radiating out from one of Soupy’s cheeky-grinned bears. Individually they are mini works of art, put them together and they are very special indeed. And while we’ve been given two blankets (DD snuggles under her Woolly Hug every night on the sofa after dinner) they are so much more than blankets. They represent and mean so much. They are love and thoughtfulness, kindness and compassion made physical. The death of a child is like no other kind of grief. It is all-encompassing and truly frightening as you have no idea if you will drown under it or come through it. Knowing that so many people cared and were thinking of us – many of them strangers – and that so many squares were coming together meant and means so much. We will cherish and look after both of our blankets, they will forever be part of our family life and will always remind me of the friendship and bonds that are formed whenever women pull together to support each other. Links to the original threads for MrsKwazii can be found here, here and also here. Two blankets were made, one for their younger daughter too.